As mentioned in the last post, it is a common problem with the PIP (pin-in-paste) process to struggle to get adequate solder volume. If the PCB and component metrics are such that obtaining enough solder (by delivering an adequate volume of solder paste) is an issue, it can be helpful to add solder preforms to increase the solder volume. In addition to assisting us with obtaining the proper solder paste volume, StencilCoach™ will also calculate the stencil aperture dimensions when solder preforms are added. A convenient solder preform size that is often used is the same size as an 0603 passive component (60 x 30 mils). The preform is placed on the solder paste deposit, so this common size is convenient as it can be placed by a component placement machine. Solder preforms typically come in a tape & reel format for easy placement by the component placement machine (no added equipment, no added training, no added time). Some engineers use dogbone-shaped apertures with preforms, as shown in Figure 1. StencilCoachTM will also calculate the dimensions for this type of stencil aperture. Figure 1. A dogbone-shaped stencil aperture is seen in the lower right. Consider the application in the last post. Recall that we were only able to print enough paste by using square apertures (as the diameter of the circular apertures required was so large that the paste deposits would overlap). 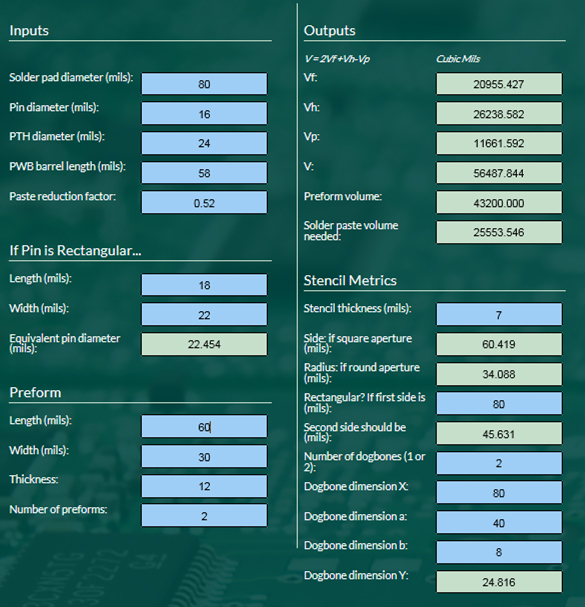 The inputs and calculations using solder preforms for this application are shown in Figure 2. By using two 0603 12-mil-thick preforms, we now only require square stencil apertures (60.5 mils) or circular apertures with a radius of 34 mils. StencilCoach will also calculate the equivalent dogbone aperture dimensions as shown in the lower right of Figure 2. Figure 2. PIP with Preform Input (blue) and Calculations (green). The Pin-in-Paste process can be helpful in that it can eliminate wave soldering, improve the cycle time, and enhance finished goods quality. In cases where stencil printing cannot deliver enough solder paste to form an acceptable solder joint, adding solder preforms can save the day.